Fabrisonic has collaborated with Micron Optics to understand the strain response of embedded fiber Bragg grating sensors in aluminum. Micron Optic’s si155 Hyperion allowed Fabrisonic to evaluate strain response 100X faster than done previously thanks to the interrogator’s high sampling rate. Micron Optic’s ENLIGHT software also allowed easy assessment of the sensors post embedding and provided data acquisition of the embedded sensors. To see a video of stain measure and the equipment, click OPTICS. Fabrisonic is developing expertise in building fiber optic strain sensors into metallic materials for health monitoring in aerospace, oil/gas, and transportation. Building these sensors into components enables measurement of strains not possible from the exterior, provides protection to the sensor from its operating environment, and adds reliability/smartness to the structure. Fabrisonic is working with government and commercial customers to bring this novel technology to the market. EWI (Edison Welding Institute) who is an affiliate of Fabrisonic opened a new innovation location in Loveland, Colorado last year. They were recently featured in an article in CompanyWeek to which they touched on Fabrisonic’s capabilities. The new EWI location opens the door to all of EWI’s expertise which includes materials joining and forming, advanced automation, additive manufacturing and much more. In January, Fabrisonic’s President, Mark Norfolk, spoke at an additive manufacturing conference held at EWI-Loveland. He spoke about embedding electronics using metal additive manufacturing, which is a hot topic with in the aerospace community. To read the full article, click COLORADO. 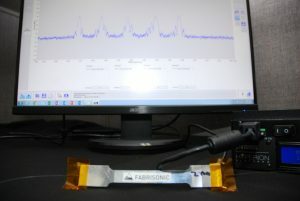 For more information about Fabrisonic visit the website at www.fabrisonic.com, email info@fabrisonic.com or call 614.688.5197.